POLYCUT model is a versatile straw shredder and blower developped on the TX27XL straw blower technology. TX27XL POLYCUT is specific because of its versatility. Thanks to its chopper ramp, it allows you to instantaneously choose straw strands’ length. Hydraulicly controlled directly from the tractor cab, control is optimal and comfortable for the user. With a 2.4m³ useful capacity, its box body is designed for round bales (Ø2m) and cubic bales (length : 2m50). With a great adaptability, TX27XL POLYCUT is available in two versions in order to fulfill all needs and all buildings configurations. In mounted version or in semi-trailed version. 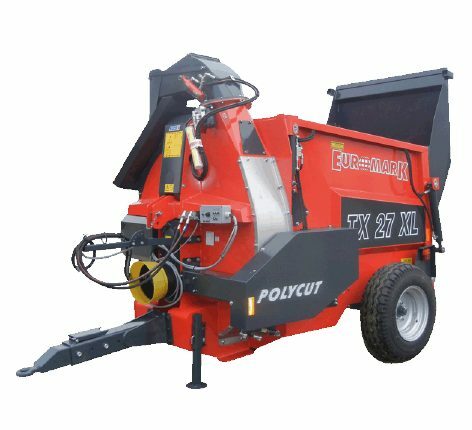 From serial production, versatile straw shredder and blower TX27XL POLYCUT has POWERDRIVE technology, patented EUROMARK innovation. A broad choice of options expands this machine’s equipment, in order to ensure you an efficient and performing work instrument, adapted to your daily needs. Serial available with a 90mm-diameter sieve, two other interchangeable sieves are optionnal. They offer different sizes of shredded strands according to your needs. Serial available with a ø90mm sieve, two other sieves are suggested, of ø30mm et ø60mm (optional). Interchangeable, they allow you to get the straw strands’ length the most adapted to your needs. Calibration sieve is mounted on a runner, easing its extraction from the machine’s side for a constraintless maintenance. The hydraulic adjustable counter-knive controls the right length of straw strands. The chopping ramp is in low position; straw must go through the sieve. The combined action of the rotative bale seperator, the knives ramp and the sieve guarantees a homogeneous and thin shredding. The chopping ramp is in high position. The passage to the turbine is maximal open, straw goes freely from the bale seperator to the ventilation chamber, straw strands remain whole. You regulate the chopping ramp at the desired height. Choose the sieve according to wanted strand length. Lateral chute, between 18 and 20m mulching (according to straw quality). POLYFLOW central chute, mulching up to 15m far in hard-to-acess areas (distance depending on straw quality). Mounted version, to offer you all perks of excellent manoeuvrability. Difficult products’ distribution is now possible thanks to POWERDRIVE system, serial installed. Developping maximal power for the bale seperator, this carrying system by hydraulicly disengageable belt is EUROMARK patented. It allows separation between the turbine and the bale seperator rotation, and the belt’s progession. Cabled ergonomic housing provides management of loading and distribution functions. Setting the belt’s speed is made with a proportional-commanded potentiometer. You would appreciate the comfort of this housing, compact and ergonomic, conceived to match every tractor’s cabs. TX27XL POLYCUT do not spread hay or wrapped bales.